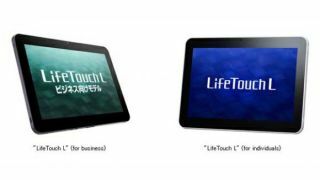 Microsoft isn't the only one showing off new a tablet - NEC is in on the act as well, with its LifeTouch L range. NEC's tablets come in two flavours - one for business people, one for regular old consumers. And both run Android 4.0 aka Ice Cream Sandwich, bringing features like face unlock and the ability to group apps in folders. The consumer model comes in either 32 or 16GB sizes, while the business version will only be available in 16GB. Both tablets have been announced for Japan, there's no word if they'll make it to UK shores. The tablet for consumers (touted as 'for individuals') will hit the shelves on July 5, while the business model is expected towards the end of that month. The only real difference between the two seems to be that the business model has extra security. They're both 7.9mm slim, which is quite a bit thinner than the iPad (which measures 9.4mm deep), and both weigh 540g - again, much less than the iPad. With these slim and light specs, you might think the tablets are smaller than the iPad, but not so. They both have a 10.1-inch screen, with a resolution of 1,200x800-pixels. Battery life is also impressive, with 13 hours of web surfing and about 10 hours of watching video. So it should last you all day at work, though you'll have to seriously shirk your duties to use up all that battery. There's no word on UK price or release, but we'll bring you more as we hear it.